which is just not my style. at. all! On top of that, the furniture was huge (I think it is designed for Barbie-style dolls) and left no room for playing. So I donated the furniture to Goodwill, and set about “renovating” the dollhouse so it was more classic in style. The first thing I did was clad the outside “walls” with wood cladding. I then painted all of the wood with crisp white glossy enamel, which is both hard wearing and easy to clean. I also added base boards, mouldings and trim throughout the house. I then added windows and doors painted in hot pink gloss enamel and finished off with flower boxes and hanging planters. To finish off the exterior, I covered the existing plastic roof with French grey coloured asphalt shingles. Next was the really fun part, decorating the interior. For the inside of the house, I really let my Shabby Chic inclinations take over. I really think this is how I would decorate my house if I had free reign and didn’t have to worry about husband’s or kids! Starting on the top floor, we have the master bedroom, decorated with a pretty rose and green ditsy wallpaper on the top, and matching stripe on the bottom. The bed is a “vintage” (read second-hand from eBay!) Fisher-Price piece, and the rest of the furniture is a wooden set found at Early Learning Centre. The carpet is dollhouse carpet, and feels and looks exactly like plush pile carpet. Next to the master bed is the bathroom, “tiled” with vinyl tile wallpaper. You would not believe how realistic the tiles look – people have actually asked me how I tiled such a tiny space! The bathroom set matches the bedroom set from the Early Learning Centre. On the other side of the dollhouse on the top floor is the nursery. I originally meant it to be unisex, but it came out quite boyish with the navy carpet. The wall paper is a pink and blue stripe with a matching teddy bear border, and the furniture is more “vintage” Fisher Price. If you ever need kid’s dollhouse furniture, then check out eBay. Gently used pieces are going for a song, and with a good wipe with disinfectant, they look as good as new. Next to the nursery is the office, with a lavender and pink wallpaper, and purple floor made from modge podged scrapbook paper. The furniture is (are you sensing a theme?) used FisherPrice. The middle floor is made up of only two rooms, and have sliding walls at either end. One room is the lounge room, and has a grey patterned floor made from more modge podged scrapbook paper. The wall paper is a lemon yellow and white diamond pattern above the moulding (real wood painted gloss white) and a blue, white and yellow plaid wallpaper below. I found the darling yellow and blue floral sofa and chair at a hobby shop, as well as the miniature rug. The “window” was a picture I found on the internet and printed off. On the other side of the lounge room is the kids’ bedroom. This is actually a real wood plank floor, made from tiny little planks sanded, stained and then poly sealed, just like a regular hardwood floor in a full-sized house. The wallpaper was picked to co-ordinate with the lounge room and is a yellow and cream stripe below the moulding and border, with a yellow and blue floral above (small scale on the main wall and a larger scale on the sliding wall). The window was another pic from the internet. On the bottom floor is another 4 rooms, with this little piano room tucked under the stairs, with another wood floor, and a pink and cream striped wallpaper. Next to the piano room is the dining room, with beige carpet, the same yellow diamond wallpaper as the lounge room, and a pink, green and yellow floral paper above the moulding. The furniture is a darling set from French company Le Toy Van that even comes with a dolls’ sized tea set. On the other side is the laundry, with a slate floor, and blue, yellow and white patterned paper on the walls. The border is a gorgeous pattern of laundry drying in the sun on an old-fashioned washing line. For some reason, the cat and the dog seem to spend most of their time in the laundry! The last room is my favourite and is the darling kitchen, with crisp white cabinets and and island, and a white and black tiled floor. The wallpaper is yellow and cream striped on the bottom and a yellow and blue floral print on the top. I love the “view” out to the garden from the french doors. Lastly, the two sets of dolls I bought. The first set took me ages to get as I wanted each doll to kind of look like our family. They are all used Fisher Price dolls, and mostly from their now defunct Hispanic range, since they looked the most like our multicultural family. Unfortunately I couldn’t find a Hispanic boy, so the one I got was the closest I could find. There is also a baby doll, but when I went to take the photos it was, of course, missing. The second set I had made for me by the fabulous Etsy seller, The Enchanted Cupboard. You send her photos and she will paint the dolls to match. If you look closely, you will see that the little girl doll has pink glasses just like Irini. I had a lot of fun “renovating” this dollhouse, and I find Irini and Stephen playing with it almost every day, which makes the enormous amount of hours I put into it all worth while. 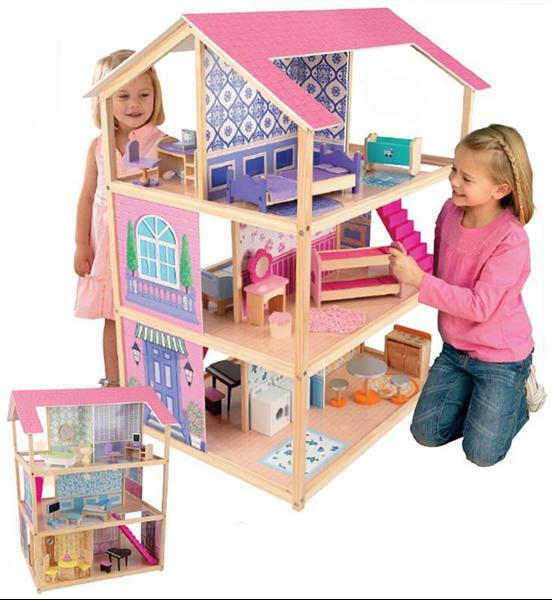 To be honest, this dollhouse ended up costing me a LOT more than if I had gone out and bought a nice one ready made. But Irini know that I made this for her, and I hoping it will not only give her years of pleasure, but maybe her children as well, and really, no amount of money can buy that.